What an amazing night. I am just so sorry that so few people came out for this incredible concert. My wife Lani came as she and I are huge fans of the band. We showed up about 10 and not many people were there yet. We sat and spoke with Ralph and Guf (from Baby Woodrose) and a Swedish friend of mine from Lund, Erik was there with his friend. Michael Bjerne, Magnus, Michael Kroglund came a little later. The band started with Tanya coming out to some intro music and images and making a huge amount of smoke with a special incense burner that she was blowing on, like making a little fire. 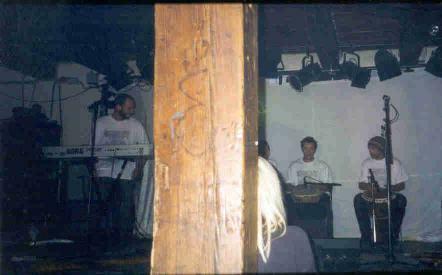 After 6 minutes or so the rest of the band filtered onto the stage and started with rain sticks and other percussion items as Boris prepared the samples on the synth and got his guitar ready. The first piece of music was very long, like 25 minutes and very spaced out. I had wondered how much they had been drinking and smoking! When I visited them in the backstage room before the show to say hello, there were many bottles of hard liquor on the table and it smelled like weed. Anyway, the visuals were totally amazing. 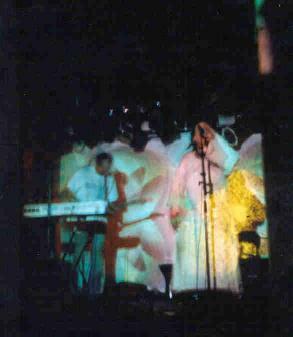 The best I have ever seen, since the first Ozric Tentacles concerts back in 1994 that I saw. What the Ozrics do now is so lame in comparison. The band played a couple of songs from Crystal Crowbar, and 3 or 4 new songs and I think Toomoze but a lot of stuff I simply did not recognize, which surprised me as I have all their CDs and a lot of live material. It was great to see them just totally improvise on all material. Boris did not play hardly any guitar so you were left with the samples (there was mainly drums, percussion and some synth and occasionally a digeridoo or throat singer), drums, bass, horns (bassoon, and small horn), Tanya and Boris’s vocals, and Boris’s KORG-Triton (highly programmed). Amazing stuff. You got taken away to a far away land by the music and visuals. The songs came across much more electronic, almost techno in nature on some of the numbers and it is not that way on their CDs at all. I was very surprised. They played for about 2 hours and the last couple of songs were the best stuff. Really cool. Tanya played a little Jews harp solo and digeridoo solo as well at the end. A great night and a great band. Don’t miss them live as it is a very special show. Amazing!